This feature is only available to subscribers of the ProZ.com Business, Business Plus or Business Enterprise packages. By adding the selected service providers to your list of filtered providers they will be excluded from quoting on your posted jobs and they will no longer appear in your searches within the 'ProZ Find' service. Are you searching for yourself? You currently have listed as a working field. This search is only returning service providers with listed as a specialty field. If you would like to appear in the results of this search please add as a specialty field in your profile settings. You currently do not have your native language variant set. This search is only returning service providers with a native language variant of Portuguese Brazilian. You can set your native language variant in your profile settings. What kind of language professional are you searching for? What languages do you need help in? How will the interpreter work? What language do you need help in? What type of subtitling work do you need help with? What type of copywriting work do you need help with? Which of the following do you care about when searching for a service provider? What type of voice do you need? What languages should the service provider know? In what country should the service provider be based? Experience the most powerful search tool for freelance service providers. ProZ.com offers direct access to freelance translators, interpreters, subtitlers and other language professionals worldwide. No fees, no commissions. Currently disabled - Purchase Business membership to enable this feature. This is a ProZ.com Business Plus and Business Enterprise feature which allows one to manually adjust the various weighting factors applied to the ProZ.com search algorithm. For example, if you think years of experience is very important you can boost the weight of that parameter. Currently disabled - Purchase Business Plus or Business Enterprise to enable this feature. Enter a value between 0 and 1,000. A higher value will give more importance to that area. Weights below marked as (deep content matches only) affect the search results only when a keyword query is provided with the search. This search is currently in a "public alpha" stage of development. Feedback and requests are appreciated. Please note that some features will be exclusively available to members upon official release. This feature requires a ProZ.com account. Log in to your ProZ.com account or get started by registering a new account. Find specialists who know the terminology specific to your project. Deep content matches search a service provider's profile and work history to look for keyword matches - KudoZ, glossaries, project histories, WIWOs, taglines, about me, Nakōdo documents and more. Try it by adding keyword terms to your query. Q: What determines the best match search result order? A: ProZ.com's best match search algorithm looks at and weighs various factors depending on the search criteria and service type. ProZ.com best match algorithm considers factors such as KudoZ points, client feedback, recency of activity at ProZ.com, years of experience, years at ProZ.com, and more. Q: Can I search by tagline? Q: Can I search by email address? Q: Can I search by name? Q: Can I search by phone number? Q: Can I do an exact match keyword search? A: Yes. Include your keyword terms in double quotes. For example: "applied linguistics"
Q: Can I adjust the weights used in best match search algorithm? 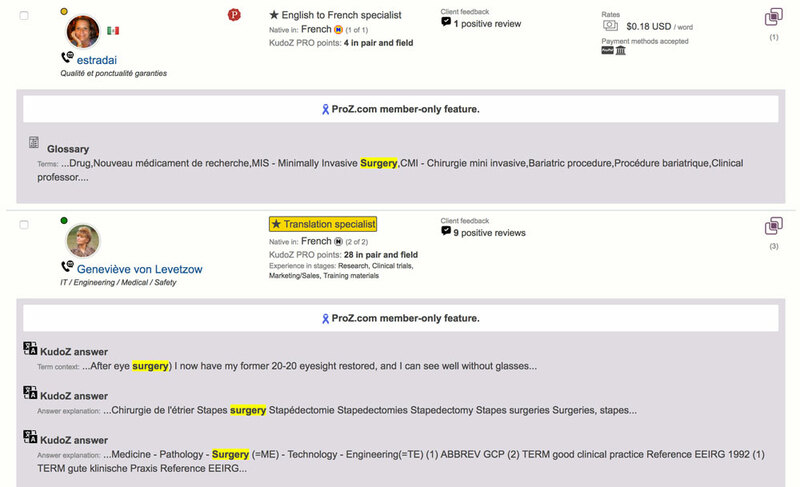 A: ProZ.com Business Plus and Business Enterprise subscribers can adjust the weighting of various factors in the search settings menu (click the gear icon). Q: Can I adjust the number of results per page? A: ProZ.com members can adjust the number of results per page in the search settings menu (click the gear icon). The maximum number of results per page is 50. Q: How many service providers can I send a batch email to? Q: As a service provider, how can I improve my position in the search results? A: Check the left sidebar in the section titled "Your position in this search". Click "View suggestions". These suggestions will be tailored to the particular search you are viewing and will help you to improve your position.